Thank God For Colors: It's Thursday and I have A SArah Kay Image!! Also I have now hit 35lbs gone but seem to be struggling with the workouts..I will not give up!! Adorable Kerri! I love the prismas and how you work with them. The frantage powder is my new love too! 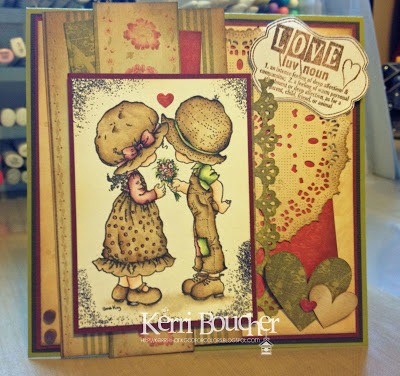 Beautiful couple...beautiful card! Completely sympathise, Kerri - I've been trying to exercise every night but managed only 4 this week! Must try harder! Love this card - so beautifully coloured and love the warm colours - just perfect for our horrible weather!